SÍLE Callinan lived a very full life and central to that was her love of football. The Cree girl sadly passed away on March 17 this year, aged just 26, having suffered a collapsed lung, brought on by Cystic Fibrosis (CF). Her death left her family and fiancé devastated. Síle was the youngest of Paddy and Mary Callinan’s three daughters and engaged to Micheál Talty, Quilty. She was a primary school teacher and worked as a resource teacher in Cree, Cooraclare and Kilrush, while Síle also taught at Labasheeda National School for a year. While her sister Anne-Marie and Micheál are certain that the last thing Síle would want is a fuss, they are leading the organisation of a 12-team seven-a-side ladies’ football tournament in Cooraclare on Saturday, October 7. “My dad has a big interest in football and the three of us played. Síle started at corner-back and she was moved up to the forwards but she didn’t hold back from anyone. She was just really determined, even with school work. Dad used to say to have the elbows out like the two indicators,” Anne-Marie chortled. Síle lived with CF but it didn’t define her. “We didn’t really take much notice of it because she wasn’t hospitalised until she was 17. Other CF patients could be in and out every couple of months. She did her exercises and she was always so fit. She had no problem that way. We knew it was there but it wasn’t stopping her doing anything that myself and Patricia (another sister) would do,” Anne-Marie explained. Micheál and Síle were together for six years, with their love of sport a common interest. “Having CF was never a barrier to her, sport-wise. She was part of the Cooraclare championship-winning teams in 2006 and 2007. Síle was passionate about ladies’ football and used to have the same frustrations that a lot of lady footballers would have. All clubs have the same frustrations, where you have no game for a long time and then a load of games together. To honour Síle and from talking to her friends, they said there are a lot of clubs that would struggle to field 15 but would always be competitive at seven, eight or nine-a-side. We thought that every club, from junior to the best senior teams, could have a crack at it. We’re also hoping to raise badly-needed funds for Cystic Fibrosis,” Micheál outlined. He vividly recalls the days before and after Síle was hospitalised. “It came completely out of the blue for everyone, including Síle. We got engaged before Christmas, on December 17. She was at the Kilmurry-Ibrickane GAA social a couple of days before she went to hospital, taking pictures with Marty Morrissey. Just completely out of the blue, her left lung collapsed. She had been doing her swimming and her exercises to keep it at bay. We were together over six years and she might be in once or twice a year for routine IVs,” he said. “Síle never let CF define her life. Even after she died, some people who knew her for years were shocked that she had CF. If anybody ever asked Síle how she was, her answer was: ‘I’m grand.’ No matter how bad it would be, she’d say ‘I’m grand.’ It wasn’t a topic of conversation with her. She wanted to be Síle who played football and Síle who was a school teacher,” Micheál reflected fondly. Síle did not dwell on her herself. She just got on with life. “A lot of people have said they learned so much about her the day of the funeral. Not that she was a private person but she was modest,” Ann-Marie observed. Micheál has found that staying busy has helped him to deal with Síle’s passing. “It has been a rough six months. She died on St Patrick’s Day. My way of coping is trying to keep occupied. We had a few things I wanted to do after she died. Every kid in the schools she taught in her parish got a medal for their sports day, with her picture on it. We also sponsored the Student of the Year Award at her secondary school in Kilmihil. The Síle Callinan Memorial Trophy will be there forever more. In her Leaving Cert year, she won Sports Person of the Year in Kilmihil,” he said. “The times I find hardest are Saturdays or Sundays, when the house is quiet. It’s very strange going to matches without her. 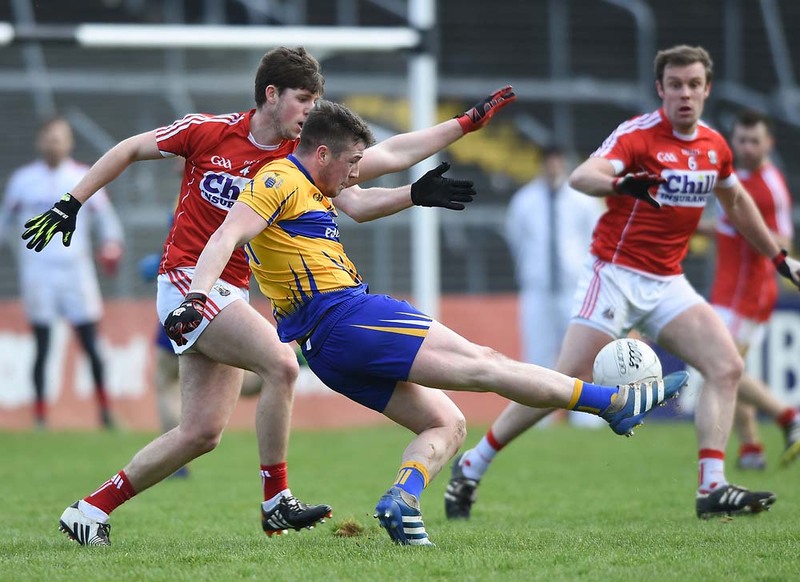 Last year, we were at the National Hurling League final and the Clare v Roscommon football championship game. She loved it as much as I loved the sport,” Micheál added. Síle was committed to every aspect of parish life and it didn’t go down well with her when things didn’t work out for Cooraclare. “She loved her parish. She was devastated when they lost the county final in 2015. We were in Doherty’s the night of the county final. She was sitting at the counter with tears in her eyes. The players were drinking pints and chatting about the game. Síle had her head down and couldn’t get over it. She had seen a few celebrations in Quilty and was probably gritting her teeth, saying they would love one in Cooraclare. She loved Cooraclare deeply,” Micheál smiled. Anne Marie noted that sport wasn’t her only community involvement in Cooraclare. “At Our Lady’s Well in Dromelihy, she was nearly a role model for the older people, doing booklets for masses and novenas,” she revealed. The seven-a-side tournament will feature a dozen teams, including a squad made up of Cooraclare’s 1996 Munster senior club winning veterans. Joe Garry is overseeing their fitness regime and is insisting that they must train not more than once before the tournament, to avoid burnout. All teams will be guaranteed four games, with a championship, shield and plate tournament, meaning that all four teams in the three groups will qualify for a semi-final. There will be no cover charge but any proceeds donated will be handed over to Cystic Fibrosis charities. “On a night out, you would never know by looking at Síle that she had any illness and she wouldn’t want you to know. She wouldn’t want a fuss but we want this tournament to honour her. We want a competitive tournament that will leave a lasting impression on girls all over the county. It’s probably a tournament that’s badly needed for a lot of clubs,” Micheál believes. The day will also have a social aspect but, most of all, it will remember Síle, who, along with playing for her club and school, also represented Clare at U-14. Anne-Marie and Micheál spoke to The Clare Champion on the evening of Cooraclare’s defeat to Miltown in the Senior Football Championship. “Patricia texted me to say that Síle would definitely have been giving out about the performance tonight,” Anne-Marie laughed.